Summer lay heavy on the crown city of Ollorawn when the scribe came to Luriel’s home. He had negotiated the narrow, fetid streets of the poorest quarters. His silk tunic was stained, his hair plastered to his brow. But he gave polite greeting and bowed with genuine respect to the ragged woman—Luriel’s aunt, Ashara—who warily opened the door at his soft knock. No spiked boots to kick it in, no razored gauntlets slicing the thick air to motion them out to their deaths. He addressed them formally, granting the deference due their scholarship. It had been three generations since anyone had treated their kind honorably. Luriel could see that her family was perplexed. What possessed this man, with his good teeth and strong bones and clear skin, his tailored clothes and fine leather satchel, to risk life and limb to see them? As Ashara admitted him and shut the door with a quick glance down the stairwell, his gaze came to rest on Luriel, and he nodded once, his gold-flecked hazel eyes sliding closed, briefly quenching the fever-bright desire that burned there. Having seen those eyes, Aunt Ashara said, “If it’s a love potion you’re after, or a healing for some relative, you’ve come a long way for naught. Our trade is banned—or hadn’t you heard?” She turned her head, as if to check the stewpot bubbling on the fire, but really to emphasize her marked cheek. “Why, then?” Corlin, Luriel’s uncle, demanded, coming down the ladder from the loft, where he had been all afternoon. Both his cheeks bore the symbols left by the king’s branding irons. He was one of the few who had transgressed twice and lived—a testament to the love the king’s son bore him when he fostered at the castle. The magelight blazed in him, and he had found his way back to his own people, and used his royal cachet as long as he could. Now even the prince could not save him, if he was caught a third time. “Why?” the court scribe echoed. His burning gaze fell again on Luriel. “I invited him,” Luriel said. Corlin and Ashara turned and openly stared. Luriel had not spoken aloud in two years. He failed to suppress a wince. Luriel felt sorry for him. She had been branded two years ago, at ten. She could not pass the castle’s gates, much less wed one of its scribes. Then run away, Luriel had said to him, so many times. Come live with us. We’ll hide you. He had smiled in his sad way, and said, Sweet Luriel. They would find me and kill me. I am a weak, frightened man approaching middle age. Escape demands a bravery I know better than to expect of myself. It’s not brave to run away, she had said. No. But it takes courage and strength of heart to build a new life for yourself. Besides, if I escaped, who would steal your materials for you? But he was brave. He was so much braver than he knew. Corlin rose from his seat, face darkening. Ashara took his arm, though there was no telling if he meant to throw the scribe out or strike Luriel for divulging their secret to a stranger. Corlin was not young, but he was a big man still roped in muscle from his dockman’s trade. The only permissible writing in Ollorawn was treaties, contracts, bills of sale…the only permissible language in Ollorawn was modern Ghardic, its common tongue. Anything else might be wizardry, and thus all else was. Seblik na Lareon spent his days copying ledgers, notating transactions, drafting letters on behalf of royalty and merchants. An amanuensis, when he craved poetry, history. Luriel had given him what she could. But she owed him so much more. The only other thing she had to offer, besides her body, which was not yet ready, and her heart, which he already had, was their great secret. He lowered his gaze, embarrassed, but nodded. Luriel beamed—but Seblik shook his head. “How did you get out of the castle?” Corlin asked. His voice was very flat. “And when you go back?” Corlin said. She eeled away from her aunt and threw herself into Seblik’s arms. He held her tight, as he had held her so long ago. The familiar rosewater smell of him mixed with the familiar smells of home—lentil stew, limewashed vellum, linseed oil, acrid ink. He breathed her name. Then he took her shoulders in firm hands, pushed her back, turned her to face her uncle, who was all the father she had now, and gave her into his keeping. It came back on her in a rush, the night of lace and terror and burning. The beginning was like any other. A duke and his scribe and two soldiers came to the door and demanded entrance. Mother, as always, made her hide under the table, this time behind the good lace draped for their solstice observance. In the wizards’ quarter, folk lived in single rooms above shops that catered only to their own, and theirs had had no loft. Luriel had seen this before: The fine boots tramped in, the orders were given, the casting was done, the boots tramped out. Although magecraft was banned, still the rich and the royal came to be cured, healed, strengthened. They paid in silver, if they paid at all. Mother said they believed it was customary. They had many misconceptions about the craft, and there was no longer anything anyone could do to set them right. Some mages considered such a visit lucky—it meant that a man of power might turn a blind eye the next time a casting was discovered. Father called those mages fools, and said they’d hang as high as anyone. Father never tried to protect her from the truth. But something was wrong. The duke was laughing, demanding they scribe a curse for him to put under his wife’s pillow. “That can’t be done with magecraft,” Mother said. It was a waste of precious vellum. A calf had died to provide the skin they scribed on. But Mother and Father complied. With only two of them, it should be a weak casting. Effective castings required three. But Father had talent and a strong spirit, and Mother’s magelight was the brightest anyone had ever seen. They chalked a ritual circle on the floor, over the ghost of all the erased circles, and sat across from each other. Father inscribed the vellum with the ancient curative verses, the next thing that Luriel was supposed to learn. She wished she could see him write. She loved his flowing hand, the cursive style of old Celyrian, the most powerful language for healings. Then he handed the vellum leaf to Mother, who painted a viridian weave of vining trefoils around his words. In the codices hidden under the floorboards they sat on, the illuminations were elaborate, gilded, permanent—but powerless. At the end, as Mother sang the words that Father had inscribed, to bind their magelights into the work, the inscribed leaf dissipated in a frosty puff, and the casting was complete. Luriel shivered. Even a casting as basic as this was a thing of awesome power. No wonder the king was afraid. Someday, she had thought, I’ll find people who aren’t afraid to fight and cast the king right out of Ollorawn, and all his nobles and all his rich men, and anyone else who says that magecraft is evil and then wastes a little calf’s life on something herbs would cure. Hurled onto the floor in the middle of the casting circle was a youth, bound and gagged, in clothes finer than Luriel had seen anyone dare wear into this quarter. What he wanted them to do was unspeakable. Luriel looked at their faces. The duke’s was pinched and cruel, the soldiers’ were scarred and craggy; the scribe’s was handsome and impassive. He held a goatskin parchment not unlike one they might use for a casting, and an inkpot, and a quill—his tools were their tools. He was gripping them very hard, and standing very straight. His tense body said everything his face did not. “Here’s your third,” the duke said. “I have other forms of incentive.” The duke motioned to his soldiers. There were three—the two who’d come in first, and the one who’d guarded the youth. Now the heaviest one grabbed Luriel, and the tallest grabbed her father. The third strode to the fire, and with gloved hands unwrapped an iron he’d tucked in his scabbard belt. He plunged its wrought end into the embers. The heavy one dragged her to the hearth. The embers hissed. “She’ll be marked anyway, when she’s older,” her mother said. Luriel had never seen an expression so flat. The mark on her mother’s cheek seemed to burn: three curved arms radiating out from a central point into a joined periphery. It represented a casting circle and three mages. Mother said they should wear it with pride. Father roared and drove his skull into the face of the soldier behind him. It all ran together: the agony, her scream, the smell of burning flesh, another scream, the scribe easing the duke’s blood-soaked body to the floor, the penknife in his hand, the shock on his face, the blood pumping from the duke’s neck and pouring from the soldier’s nose, the soldier’s sword in Father’s grip as he launched himself, too late, to save her. The heavy soldier released her and drew his sword. The other dropped the hot iron and drew his own. She picked up the iron. The heavy one shifted to run her father through. She drove her arm up straight and caught him in the throat. He crumpled, gasping, clutching at his neck. He didn’t seem to be able to breathe. The bones in her arm were jammed together; her hand was burned. She turned around as her father’s sword clanged on the sword of the soldier who’d branded her. The two blades formed a bright X in the fire’s glow. Her father’s blade twisted and brought the soldier’s down. Father glanced at her. The soldier’s left hand was at his belt. Her mother shouted as the knife came out. Father looked back, but not in time; he froze, impaled on the blade, then spat into the soldier’s face. The soldier flinched. He did not see Father hefting the sword in a last, monumental effort. Its arc took it through the soldier’s neck. “Galandra,” her father said as he fell, and died. Her mother’s name. But it was not brave to run away. The pain of her seared cheek was maddening. Her father lay in a pool of blood. There was blood everywhere. This was her home. It had all happened in an instant, one endless, impossible instant. The world could change that quickly. In an eyeblink. She ran, blindly, screaming, at the armored man who was going to kill her mother. She tripped over the bound man in the casting circle and sprawled under the guard’s blade, into his knees. The guard staggered and fell next to his duke, where the scribe still knelt. Luriel looked up into the scribe’s beautiful face. It twisted into an expression of anguish as he wrenched the duke’s knife free and, with a sob, brought it down, overhand, into the back of the guard’s neck. Now there would be no soldiers to tell what had happened here. Luriel knew that was important. She would never, ever tell what had happened here. She could not speak anyway for the agony in her face, but she would not speak—not until the world was whole again, no matter how long that might be. Her mother had taken her, and their store of codices, to her sister’s house. They’d released the youth; he’d aided mages before, and a mage had given his life in defense of him. And though they did not trust him they let him go, because Mother decided it. What they did with her father, or the dead duke and his soldiers, they never told her. The scribe had stood by her mother as long as he could, then gone off to summon the city watch and give them some agreed-upon story. Then her mother had left. To keep Luriel safe, she said. Because there was work to do. Someday, she’d thought, I’ll find people who aren’t afraid to fight, and we’ll kill the king, and all his dukes and all his soldiers. The scribe had been afraid, but he had fought. She spent weeks trying to find him, haunting the merchant quarter, turning a fair cheek to anyone who saw her, going back after they saw the mark anyway and shooed her off or tried to wheedle secrets from her. She said nothing to any of them. When she spotted him at last, striding out of the quarter toward the Kingsroad, she ran after him and tugged on his coat. He hissed when he recognized her and hustled her into a shadowed alley. She’d carried ink and quill and scroll in a little pouch all those weeks. She drew them out now, and wrote, What is your name? Old Celyrian, she wrote, sounding the name out in Ghardic. Can you not read that? Impatient, she stamped her foot and huffed. He had not answered her question. He smiled, and took her quill. Seblik na Lareon, he wrote, then tapped the page with equal, but feigned, impatience. Luriel na Galandra, she wrote in return. Will you meet me again? He addressed that last to Luriel, where she sat on the hearthstones, arms crossed stubbornly across her chest. She remembered the day she first spoke again. It was the day she realized she loved him, and that with him by her side, she and her mother would be three again. Now Mother could come back. “What did it mean, in ancient times?” Seblik asked. Ashara burst through the door just as Corlin frowned at the fire and asked if they smelled some foul thing burning. “It’s begun,” she said. Luriel went to the window as Corlin swore and Seblik cursed himself for a fool. They were at the top of their building, four stories up, where it leaned out and nearly touched the building across from it, but the side window had a good view down the street. Toward the far end of the wizards’ quarter, the sky glowed, like a sunset in the middle of the night. “They’ve started at the castle end,” Corlin said, wrapping food in waxed linen and shoving it into a woollen sack. “We’re lucky.” Luriel’s clothes were folded and ready, and it took only moments to add them to the canvas duffel with the others. Ashara was climbing into the loft, where they’d brought the codices from all their hideyholes. “We can’t take them all!” she said, looking at the battered leather satchel that was the sturdiest carryall they owned. “Hide them here, stay here!” Luriel cried, past all reason. “I can’t choose. I don’t know which ones we’ll need,” Ashara moaned. Corlin had tried all afternoon to sort them, and failed. All were precious. “Wait!” Luriel cried. She ducked under his embrace and back inside. “Luriel, we haven’t time,” Ashara snapped. They could hear the cries now, the smashing doors, the dull clank of metal. Luriel snatched up the velvet-bound codex that Seblik had given her to write dreams and wishes in. She pressed it into his hands. “But this was a gift, it was for you…” he said helplessly. “Now it’s full, and now it’s for you,” she said. Then they were gone, out into the smoky night, rushing down the street, away from the clamor of riot, the roar of conflagration. Bound for exile in a land that no one had even named. She would see her mother again…but they would be only two, now. They walked long into the night, past the city gates, past the silent fields, into a rocky place that she had never been. Ahead of her lay only places she had never been. Other refugees joined them. Most were marked. All burned with magelight. Some spoke quietly as they walked, but Luriel just walked. She thought of the verses she had scribed for Seblik, lines of admiration and regret, illuminated with gratitude and hope. She envisioned him reading them—reading the old Celyrian she had taught him, teaching others how to read it. He’s braver than he thinks he is, she told herself. She did not look back. She would see him again. Celyrian was the language of healing. 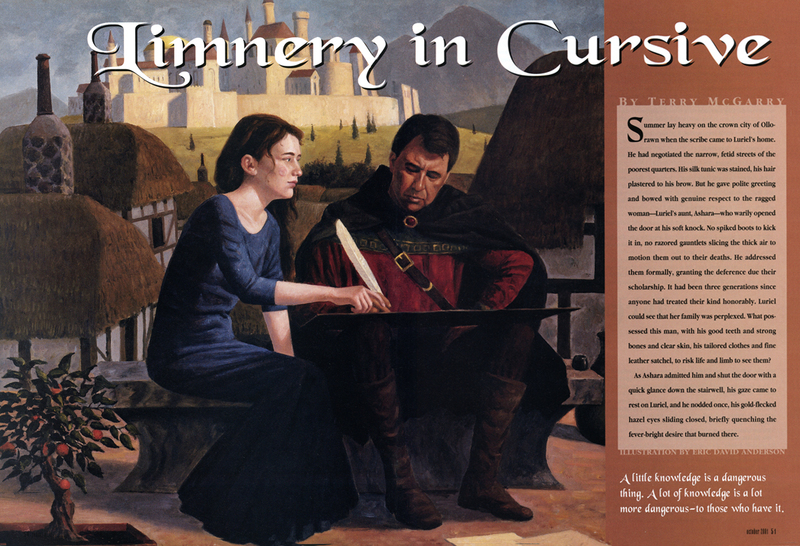 This story originally appeared in the October 2001 issue of Realms of Fantasy , edited by Shawna McCarthy, with art by Eric David Anderson.